Curb: A curb chain is a chain in which circular links interlock and lie flat close together, often having a masculine look. Curb chains can come in a variety of widths, and their links are uniform in size. Compared to other styles, these links are wider. Concave Curb Links: The center of these types of necklaces and bracelets is lower than the edges, creating a concave shape. Some gold concave links have pave etchings in the same or different type of gold color running along the center, creating a slight shimmer and dynamic effect. → Click Here to Browse Our Curb Chains. 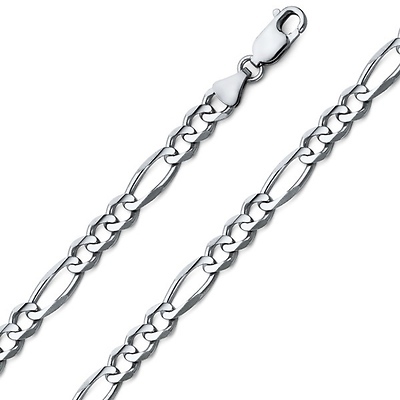 Figaro: A Figaro chain is a chain that is designed with several small round links interspersed with one long oval link. This style of chain originated in Italy, and two popular operas, "The Barber of Seville" and "The Marriage of Figaro," arguably inspired the name of this style. 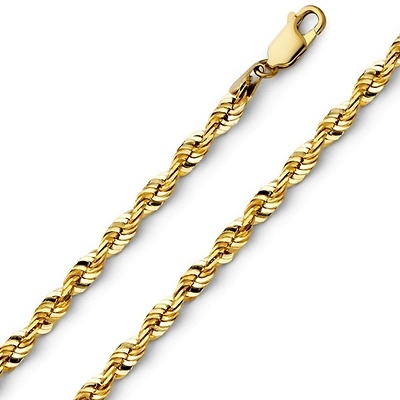 Figaro chains are frequently used for men's jewelry that are worn alone or with a pendant. Yet, thinner links paired with a pendant or charm make an elegant jewelry accessory for women as well. 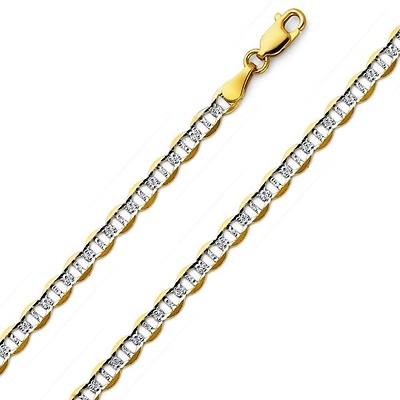 → Click Here to Browse Our Figaro Chains. Mariner: Mariner chains are similar to curb links, but they resemble the chains attached to an anchor on boats, hence its name. 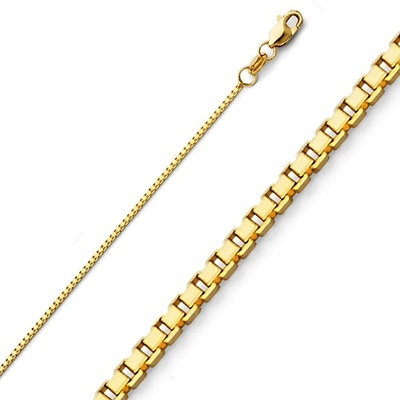 This style of chain comes in a traditional, slightly rounded edge design or a flat link style. These links are popular for ID bracelets, any jewelry with nautical themes, and unisex style jewelry. → Click Here to Browse Our Mariner Chains. 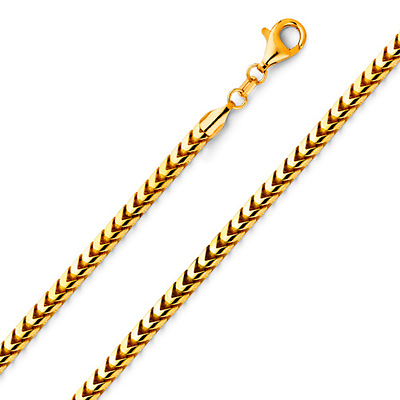 Rope: Rope chains are actually strands of gold that intertwine to resemble a genuine rope. Rope chains come in both delicate versions where they are a popular choice for pendant necklaces, and heavier versions where the chain itself is the main attraction. These chains vary by the amount of weave -- the tighter the braid, the more metal is used which increases the price. When comparing different chains, look at whether the chain has a tighter or looser braid. → Click Here to Browse Our Rope Chains. Snake: Rather than visible links, snake chains are made up of rings which fit together closely, making a chain with an appearance of a flexible tube with the texture of snakeskin. Snake chains are usually narrow and delicate, which make them ideal for pendants. Our company has thin snake link necklaces typically made for women. → Click Here to Browse Our Snake Chains. Box: Box chains have squared off links rather than rounded links, giving the chain a boxy appearance. 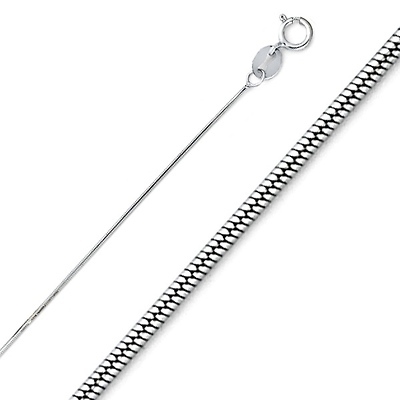 Thinner versions of box chains are popular for women's jewelry and often paired up with pendants. We offer box link widths from 0.5mm to 1.8mm. → Click Here to Browse Our Box Chains. Franco: An increasingly popular style, an Italian designer, named Franco, created the Franco chain. 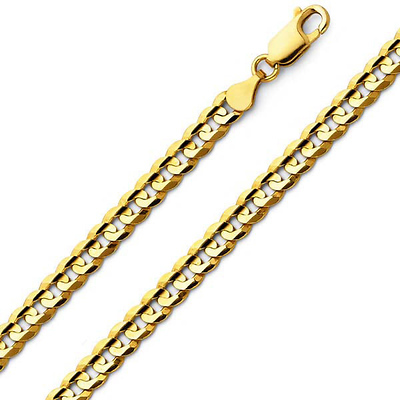 This design is similar to a Cuban link chain but four-sided. creating a tightly-linked tubular structure that also resembles a snake chain. Its roundedness allows more flexibility and reduces tangles as well as displaying elegant, attractive links. Varying in width, thinner Francos make an excellent choice to wear with pendants while thicker ones can be worn alone. → Click Here to Browse Our Franco Chains. If you have any questions about jewelry, call Customer Service toll free at (888) 223-7056. We are open from Monday - Friday, 10am - 2pm PT. We'll be glad to help.